As expected, YouTube today opened up a Swedish version of the site. A launch video is posted on the site in which a number of celebrities welcome YouTube to Sweden, including Google’s Chief Internet Evangelist Vint Cerf; Mona Sahlin, leader of the Social Democrats and Ulf Ekberg of pop combo Ace of Base. The video is also promoted on the front page of the Social Democratic Party webpage (!). For some reason YouTube has made it very hard to embed this launch video and it took me a while to find the embed code. 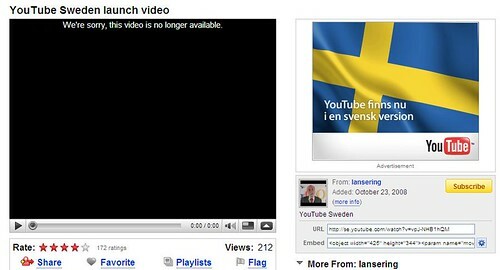 What the video does not reveal is how a Swedish version is any different than using the global site. Everything on the site is still in English, a language most Swedes handle very well. On top of this, the launch video is suddenly unavailable. Probably temporarily, because as I type this the video comes back up, becomes unavailable again, then up again. Tags: sweden, youtube, mona sahlin, youtube, video. Ping.